Getting enough sleep is an issue for most of us, but perhaps even more so for high school students. Here are suggestions for an article and a video on sleep and why it matters. The PBS Frontline article discusses how sleep affects the teen brain, and the TED Ed video explains why sleep is a better preparation than cramming for a test or a piano recital. There is also a set of questions as an introduction and follow up, and a crossword to practice sleep vocabulary. There is a lot of material on the Internet about sleep, but much of it is written in complex language or not really interesting to kids. Even the PBS article that I felt would be most helpful is rather long, but to me it’s useful enough to be worth it. The TED Ed video is quite short, but has no written transcript. I would use them both, as they each add useful information. As a warm-up, to “activate prior knowledge” and arouse curiosity, pass out the question sheet (“How much do you really know about sleep?”) The questions are all based directly (and in order) on the TED Ed video and the PBS article, so it can serve as a check and review as students watch the video and read through the article. You might want to let students fill it out in pairs, especially if their English is limited. Before showing the video and again as you pass out the article, suggest that students listen and look especially for the answers to these questions. Ask them to go over the questions again afterwards to make any corrections necessary. Pair students from group A with those from group B to teach the other at least (two or) three important things they learned, and have them go over the questions together. You might do a class de-briefing afterwards, to make sure they all understood. Also ask what they already knew and what they found surprising. The crossword will help reinforce possibly new vocabulary. If you want, you can check their retention of vocabulary and main ideas by giving them the questions as a quiz a day or so later. Click here for the PBS article. The sleep questions and answers are the first (free) pdf download on this page. 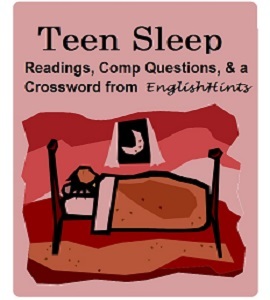 Click here (or right-click to download) for the crossword by itself (It’s also included in the Teen Sleep pdf with the questions for students.) and here for the answers.